The Tri-Color Ink Cartridge from Microboards is a replacement ink cartridge that is compatible with the GX-2 Disc Publisher, the GX-Auto Printer, the G3 Publisher and the G3 Autoprinter. These devices use a single cartridge for printing, so you can be sure that this is the correct one to replace. This ink cartridge is a compatible with the GX-2 Disc Printer, the GX-Auto Printer, the G3 Publisher and the G3 Autoprinter. from Microboards. It's always a good idea to have a spare ink cartridge on hand. 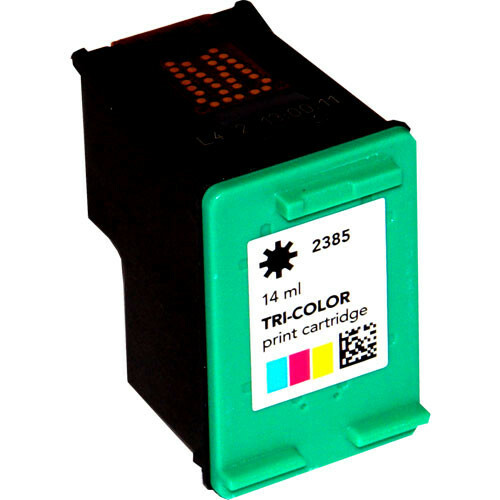 Box Dimensions (LxWxH) 5.5 x 3.5 x 1.5"
Tri-Color Ink Cartridge is rated 4.4 out of 5 by 21. Rated 5 out of 5 by Video Craft Pro, Inc. from INK INK INK The Tri-Color Ink Cartridge by Microboards is a great product. The 3 colors in one allows me to use with my Micorboards G3 Disc printer with ease. You can count on a great product supplied by a large facility which no matter what the size or cost can produce top notch satisfaction from its customers. This product out does every expectation I have for the use. From the 1st disc to the 1,0000.....the quality maintains color and redundancy. With the 4 color 1200dpi resolution, I can create outstanding print quality. Just like it was printed from a large replication facility. Rated 5 out of 5 by Krin from It Works These cartridges last a while, and produce rich, vivid color. Too bad I don't have anything nice to say about the actual GX-2 Duplicator itself. Rated 3 out of 5 by David from Works, but forces change before empty Works, but forces change before empty, wasting ink. Rated 5 out of 5 by J&J Video from Good ink for a great printer The ink purchased for the GX series Disc printer is very good. I have a lot of comments on the quality of each disc turned out for the jobs I do. I would highly recommend purchasing a GX Series Disc printer from Microboards and begin using this ink cartridge today! Rated 3 out of 5 by mcogan from I don't get a choice. I have no other choice as it's the only ink cartridge that fits my duplicator. It works OK most times but the price is ridiculous. However, B&H has the best price of anyone and free shipping which is a big help. Great service, too. Rated 5 out of 5 by F. Reid from It Worked Great!!! I've purchased this product from other companies and this was the first time that it worked so well. I got most of my DVD printing done with two cartridges. I only had to change it out whe nit was empty.